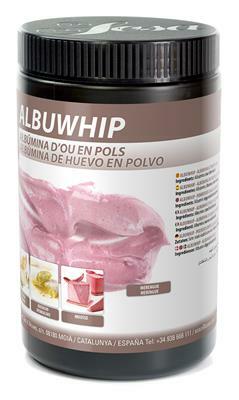 Sosa albumin is a substitute for egg white and a foaming agent which can be used with any kind of liquid. The typical dosage is 80-100g per kg; Sosa albumin gives 25% more foam and is 5 times more stable than fresh egg white. You can use Sosa Albumin when making meringues, macarons, soufflés, marshmallows and foamy cocktails.